Here’s a glance at some of the breakthroughs, events, products and happenings that took place in the snack food industry within Snack Food & Wholesale Bakery’s 100-year existence and even a ‘tidbit’ before. According to the website, ideafinder.com, we consume more than 4.3 billion lb. of snack food a year, which could be why snacks may soon end up becoming America’s favorite meal. What an interesting time for Snack Food & Wholesale Bakery to celebrate its centennial anniversary. 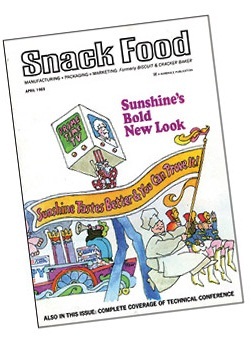 Coincidentally, the Snack Food Association (SFA), Arlington, Va., an international association that has manufacturing members, including snack manufacturers and suppliers to the snack industry in more than 50 countries around the world, is celebrating its 75th anniversary in 2012. We congratulate the SFA on an incredible job. The association has provided us with myriad details about the past of snacks. With the amount of space available here, we can only briefly describe a few of the numerous events, milestones, breakthroughs and other happenings in snacks, that have experienced an incredible ride through the last 100 years and beyond. We can’t really describe what has taken place over the last 100 years in snacks without going back a bit farther in time. A global industry today, the snack food business, with all its pop, flavor, chewiness and of course, crunch, has billions of fans who might not have ever paid attention had fate not intervened nearly 160 years ago in the resort area of Saratoga Springs, New York, and 75 years ago in Cleveland. If you can’t eat just one potato chip, blame it on chef George Crum. He reportedly created the salty snack in 1853 at Moon’s Lake House near Saratoga Springs, New York. Fed up with Commodore Cornelius Vanderbilt, a frequent customer, who continuously sent his fried potatoes back, complaining that they were soggy and not crunchy enough, Crum sliced some potatoes as thin as possible, fried them in hot grease, then doused them with salt. Bingo. Vanderbilt loved them, and “Saratoga Chips” quickly became a popular item at the lodge and throughout New England. Eventually, the chips were mass-produced for home consumption, but since they were stored in barrels or tins, they quickly went stale. Then, in the 1920s, Laura Scudder of Anaheim, Calif., invented an airtight bag by ironing two pieces of waxed paper together, which kept the chips fresh longer. Today, potato chips are packaged in metalized polyester or foil bags or paperboard containers. The chips come in a variety of flavors, including sour cream and onion, barbecue, salt and vinegar and even some that taste like hot dog relish. In the 1890s, William Tappenden, an entrepreneur in Cleveland, decided to make a business out of cooking and distributing potato chips. Tappenden mastered the art of cooking paper-thin chips on his kitchen stove and soon started delivering them to local grocery stores in a horse-drawn carriage. Business picked up, so he turned his barn into a potato chip factory. Competitors across the country quickly copied Tappenden’s concept, and the snack food industry was born. In 1906, three years after the Wright Brothers’ first flight at Kitty Hawk, North Carolina, Amedeo Obici, a young Italian immigrant, cofounded Planters Peanuts, and developed a process for commercially roasting shelled peanuts. Little did Obici know, but his small business would one day blossom into one of the world’s grandest nut companies. On November 11, 1901, the Biscuit & Cracker Manufacturers’ Association (B&CMA) was established in Cincinnati, during the era of the nostalgic cracker barrel. The time was aptly characterized by B&CMA’s “Biscuit Boy” logo and trademark. The B&CMA continues today as an international trade organization that represents the entire scope of companies involved in the manufacturing of biscuits and crackers as well as suppliers to the baking industry. Its mission is to bring unparalleled educational training programs and networking opportunities to its members. A great deal has changed at Lance (now Snyder’s-Lance, Inc.) over the years since Phillip Lance began selling roasted peanuts for a nickel bag in Charlotte, N.C., in 1913. What began as 500 lb. of unwanted peanuts and Lance’s dream has bloomed and evolved into a multi-million-dollar national company that produces 16 varieties of sandwich crackers that are baked fresh with peanut butter and real cheese fillings, or nuts, cookies, popcorn, cakes and many other snack foods. Likewise, Snyder’s of Hanover, Hanover, Pa., got its start in 1909 when Harry V. Warehime, founder of the Hanover Canning Co., and Snyder’s parent company until 1980, began producing Olde Tyme Pretzels. Years later in the 1920’s, Eda and Edward Snyder II began frying potato chips in a kettle at their home during the summer and peddled the snack door-to-door and to fairs and farmers’ markets. Their son, William V. and his wife Helen, made angel food cakes in their basement for local stores, and in 1924, the families combined their home businesses and Snyder’s Bakery was born. And who can forget Ritz Crackers? The premium snack cracker brand was introduced by NabisCo in 1934, according to the website, foodtimeline.org. It says that based on records of the U.S. Patent and Trademark Office, the National Biscuit Company (Nabisco) introduced this stylish cracker, but it actually got its start in 1801. That was when retired sea captain John Bent adapted a hardtack recipe. Bent took a hardened “biscuit” (an English term for cracker) and added leavening agents until it became flat and crisp. Bent’s family baked the biscuits while he traveled the countryside, selling crackers from his wagon. The basic cracker recipe was refined four years later by the Kennedy Biscuit Works, which used spongy dough for a lighter consistency. In 1898, Kennedy Biscuit Works and dozens of other bakeries across America joined forces to form the National Biscuit Company. NabsiCo perfected the recipe in 1934, according to reports. The result was a smooth, flaky cracker hinting of butter. Unlike other crackers that were pale and square, these creations were golden and rounded, with serrated edges. A company-wide cracker naming contest yielded the name Ritz, presumably after the posh Ritz-Carlton Hotel. Nabisco’s North Philadelphia bakery began producing them and they were introduced at markets in Philadelphia and Baltimore. By 1935 Ritz was distributed nationally. Some of Ritz’s appeal lies in its relatively low price and mass production by Nabisco, the only baking manufacturer with the facilities to distribute nationwide at that time. Nabisco was able to price a box of Ritz crackers at an affordable 19 cents. The circular shaped/buttery-tasting crackers today come in many varieties, such as whole wheat, low-sodium, brown sugar cinnamon variety, garlic butter and many more. But while crackers had an honorable place in history, potato chips came on just as strong. People loved them. The SFA says that the many original snack entrepreneurs included Daniel Mikesells of Dayton, Ohio, who started Mike-Sells, Scudder, Bill and Sallie Utz of Utz Quality Foods in Hanover, Pa., the Arnold family of Bristol, Tenn., which started Moore’s Potato Chips and Earl Wise, Sr. of Berwick, Pa.
All of the many chip makers or inventors had fascinating stories to tell about starting a potato chip business. Most often, things were developed by accident or came to be because of mistakes that worked. For example, in 1921, Earl Wise, Sr., who ran a small deli in Berwick, Pa, made a discovery that was really plain old luck. Wise had an abundant supply of potatoes, which he feared would rapidly rot. His sister suggested that he turn them into potato chips, which he did in his mother’ kitchen, and then sold at the deli and to other merchants. Wise’s products eventually became a dominant brand on the East Coast. Only four years after Wise made his first potato chip, he opened his first production plant, a 32×75-ft. concrete building that he continued to expand over the next two decades until 1944. That was when the plant was destroyed in a fire that brought production to a halt. After eight months, a new state-of-the-art production facility was built and expanded for the remainder of the decade. Utz Quality Foods also got started in 1921, in the kitchen of Bill and Salie Utz’s home in Hanover, Pa. Bill and Salie originally sold chips at small grocery stores and farmer’s markets and the company used a slogan, “Farmer’s Market Fresh,” in its ads for many years. The company still maintains a small-town image every chance it gets. It churned out 50 lb. of potato chips an hour. The company was incorporated in 1947 and two years later, purchased a 5-acre tract of land to build a 67,000-sq.-ft. production facility. Utz also installed two 600-lb./hour potato cookers and was on its way to continued growth and expansion. “We want people to know that it’s a family-owned, long-term operation from a little town in Pennsylvania that puts out high quality products in limited distribution,” said Tom Dempsey, vice president of sales and marketing back in 1994 for a cover story at the time with Snack Food & Wholesale Bakery. Today, Mike and Jane Rice represent Utz’s third generation of family leadership. Mike’s grandparents are Bill and Salie Utz. By the middle 1930s, potato chip plants were scattered all over the country. All of them were small or regional businesses. And many soon added other snacks to their lineup, including pretzels, popcorn and peanuts, all of which had emerged commercially since George Crum’s invention. Most details about the origin of another of America’s favorite snack foods—pretzels—is loosely based on myths and folklore rather than documented facts. According to foodtimeline.org, hard-baked bread and flour goods actually originated in ancient times, when biscuits (which means “twice baked”) helped fuel the Romans. Food historians and Catholic scholars generally agree that, from early times, pretzels held a special place in Lent. The word “pretzel” is from German, and is believed to refer to the Latin word pretium for “reward.” Others trace the roots to the Latin word, brachium, meaning arm, according to the Encyclopedia of American Food and Drink. Julius Sturgis established America’s first commercial pretzel bakery in 1861. He operated a bread bakery in Lititz, Pa., and legend has it that a wanderer who had hitched a ride on a train that ran behind the bakery followed the smell of freshly baked bread, looking for a job and something to eat. Julius couldn’t offer the man a job, but extended his hospitality and invited the man to sit down at the family dinner table. In exchange for the kindness, the man gave Julius a pretzel recipe. The Julius Sturgis Pretzel Bakery says that specific details are sketchy, and it’s not sure how the story came about, but what is known is that after 11 years as a baker, Sturgis stopped making bread and established the first commercial pretzel bakery in America. Chocolate-covered pretzels proliferated in the 20th century. Early dipping items featured nuts (peanuts, pecans), fruits (pineapple, strawberries, cherries) and biscuits/biscotti. Display ads in the early 1930s for Benzel’s Large Chocolate Coated Pretzels indicate that a dozen cost only 10 cents. Other pretzel pioneers include Jacob Bachman, Reading, Pa., founder of the Eichler bakery (later Anderson bakeries) in Lancaster, Pa., The Wege Co., Hanover, Pa. and Reading Pretzel Machinery Co., which launched the first automatic pretzel twisting machine in 1933, four years after a continuous cooker was developed for the potato chip market. Before this time, commercial pretzel production was often performed on a cracker-cutting machine. In 1930’s, snacks included the four p’s—potato chips, popcorn, pretzels and peanuts. Then a different kind of chips came on the scene: Corn chips. The crunchy, salty, thick chips were commercially introduced by I.J. Filler, a traveling salesman who developed the idea for corn chips while eating at a small Mexican restaurant in San Antonio. Filler received a patent for corn chips in 1933. A year earlier, 26-year-old Elmer Doolin also walked into a small restaurant in San Antonio, and purchased a nickel sandwich and a five-cent plain package of ribbon-shaped corn chips. He liked the taste and looked up the manufacturer, who turned out to be a homesick man from Mexico. The story goes that Doolin borrowed $100 and bought the man’s recipe, rights to his 19 retail accounts and his production equipment: A hand-held potato ricer. Frito’s were born. By 1935, Doolin was in Dallas and was becoming the king of corn chips, but he recognized the power of potato chips, and also introduced them into his growing enterprise. About the time Doolin was discovering the corn chip, Herman Lay lost his job with Sunshine Biscuit Co. in Atlanta and took a job as a route salesman’s helper, selling peanut butter sandwiches. When the company’s founder died, Lay, who had become a distributor, bought the company and established a bonafide snack food enterprise, including potato chips. Frito-Lay was on its way. That’s when H.W. Lay & Co. became one of the largest snack food companies in the Southeast, and merged in 1961 with the Frito Co. to become Frito-Lay, Inc. LAY’S brand potato chips are still what Frito-Lay North America presently says is America’s favorite potato chip. Today, Frito-Lay brands account for 59% of the U.S. snack chip industry. The Dallas-based company presently has more than 45,000 Frito-Lay employees in the United States and Canada, dozens of brands, including Cheetos, Sun Chips, Santitas, Ruffles, Rold Gold and more. According to the SFA, the young snack industry was growing rapidly, but the business was fragmented with no overall focus. Harvey F. Noss, a Cleveland advertising salesman whose family owned a local potato chip, ice cream cone and pretzel manufacturing company called Num Num Foods, changed that. With Crum and Tappenden being two of the three principal players responsible for the creation of the snack food industry, the third was Noss, says the SFA. Noss persuaded other Ohio-area chip manufacturers to join forces in a loose-knot organization called the Ohio Chip Association. The group developed a radio advertising campaign and other promotions to sell potato chips. But Noss thought about what a national organization of chip manufacturers could do for the future of the rapidly growing industry as far as public relations, marketing and other services were concerned. Noss and his colleagues expanded their regional organization into the National Potato Chip Institute (NPCI), which would later become the SFA. They held the group’s first meeting in Cleveland, with Noss as the first president. Noss eventually became the association’s paid leader, and the NPCI developed programs to educate consumers and retailers about potato chips, developed quality standards for manufacturers, adopted a package quality assurance seal for members and a series of literature that discussed the nutritional value of potato chips. That same year, the SNAXPO show got its start, and has been putting the power of exhibitors to work for all attendees ever since. The show has become the world’s largest, most comprehensive event devoted exclusively to the international snack food industry, bringing together owners, executives and buyers from every segment of the market. The SFA notes that SNAXPO 2012 exhibition and conference in Phoenix welcomed some 1,500 domestic and international snack food management professionals. The SFA points out that a special committee led by Noss put together a list of reasons why potato chips were essential, and went to Washington D.C. to sell the idea to the bureaucrats. By the time he headed home, the potato chip industry was not only deemed “essential,” the NPCI’s members were allowed to obtain enough raw materials, gasoline and tires to continue producing. When the war ended in August, 1945, the industry geared up for a big push, but there were still lingering technical problems. Hand cooking was giving way to continuous fryers, though manufacturers were still packaging chips and other snack products by hand. Daniel Woodman, working as a consultant to Herman Lay, developed the first pre-formed bagmaking machine and soon, the snack industry was well on the way to automating its packaging functions. In the early 1970s, Pace analyzed his business, which was still in a startup mode, and saw that his Picante sauce provided about 80% of sales, and he actually discontinued all other products. Sands found this a bold move. “I find it remarkable,” he was quoted in our pages as saying. “That’s hard to do when you’re in a startup mode.” But going forward as a specialist in Mexican sauces, it proved to be the right idea for David Pace. The company today uses more than 25 million lb of fresh jalapenos each year and the same recipe David Pace created more than 60 years ago. Like Pace, James Stauffer Herr wanted to pursue his own idea of the American dream. He left his father’s farm and with $1,750, purchased a small potato chip company in Lancaster, Pa. In 1947, the business moved into a vacated tobacco shed on the Herr family farm. As he learned more about the business, Jim Herr developed new and better cooking processes and a delicious snack food became even better. As demand for Herr’s potato chips grew, so did the company. A few years later, Jim Herr located a 3,600-sq.-ft. bakery facility available for rent in the small town of West Willow, Pa. The bakery, along with an adjacent house, became workplace and home for Jim and his wife Mim. The company would eventually become one of the nation’s leading regional chip players. On the packaging side of things, Cellu-Craft, Inc., founded in 1937, in Brooklyn, N.Y., as a small printer of packaging materials, and has logged many milestones over the years, according to the SFA’s book, 50 Years: A Foundation for the Future. By 1974, the company expanded twice, tripled its volume and continued to expand through acquisitions and organic growth. The firm purchased the assets of Vision-Wrap Co. in 1978, which increased production capacity substantially. Aseeco Corp. developed sanitary bulk material handling machinery and conveying systems some years later, including a sanitary bucket elevator conveyor call the Aseeco-Lift, which quickly became a standard of the food industry. Curwood Co. also grew from a three-person packaging film producer with just one extruder/laminator to a comprehensive flexible barrier packaging resource, providing various snack food packaging materials. The company became a wholly-owned subsidiary of the Bemis Co. in 1965 and remains so today, but is now a world leader in high-barrier packaging materials and systems for food, beverage, household, industrial and personal care industries. What really exploded the growth of potato chips and other snacks and put them on the national map was television. In 1950, Americans owned 1.5 million TV sets. The figure continued to grow until most households had multiple sets in the mid to late 1960s. The impact on the industry was amazing. Folks sat around the tube, watching the fights, football and Milton Berle, munching snacks. Two new snack products were introduced in the early 1950s: Cheese flavored, extruded corn puffs; and pork rinds. There were now six major salted snack products available to retail customers. Bellville Marking Corp. started business in 1959 as an ink and printing products supplier. The company invented reciprocating ink coders with a patented ink cartridge for vertical form-and-fill packaging machines that could print dates and prices on film for snack packages. Cornnuts was a family business selling a toasted corn nugget-like product to local bars and taverns around Oakland Calif., in the late 1940s. The crunchy, nutty-tasting snack, which is fiber-filled kerns of corn, had really caught on. Through World War II, shipments of imported Cuzco corn, from which the company used to make its product were cut off, and it discovered a small kernel corn to use instead at that time. Supplies of the larger imported corn were re-established in the mid-1950s, but by that time, company geneticists created an oversized, domestic corn hybrid, that was four times larger than ordinary domestic corn kernels. Since 1969, the Cornnuts’ crop has been grown in California and Ohio, and the product is sold in supermarkets, vending machines and bars across the United States and many other countries. The 1950s was a golden era for in the snack food industry. A population explosion was taking place in America—there were 18 million more people than in 1940, says SFA. And they had an undeniable appetite for snacks. Though potato chips were still the best seller, pretzels were expanding, popcorn sales in theaters and small outlets were at an all-time high, and there was a bigger market for packaged popped corn and caramel corn. Meanwhile, as the Frito Co. acquired several large regional players, Herman Lay was busy building plants throughout the Southeast and buying up pretzel and potato chip plants as far West as Los Angeles. In 1961, the industry was stunned when The Frito Co. and H.W. Lay Company merged to create what was a $135-million corporation that forever changed the face of snack foods. However, Elmer Doolin never lived to see the accomplishment, having died in 1959, at the age of 56. SFA notes that by the middle of the 1960s, snack sales had reached nearly $750 million in America. In 1961, at a historic meeting in Frankfurt, Germany, the European Regional was formed as a part of what now had become the Potato Chip Institute International or PCII. By 1964, the European regional had 88 members. Incredibly, Noss was also invited to Russia, behind the Iron Curtain, to talk about potato chips. In 1978, the Regional would become an independent group called the European Chip and Snack Association, which is now called the European Snack Association (ESA). In 1964, Herr’s made a major packaging move that helped revolutionize sales. For years, its chips were sold in wax paper bags for 5, 10 and 15 cents each, depending on the size. A twin-pack (two bags inside a larger cellophane package) was also available at about 49 cents. Another new product would quickly push sales past the billion-dollar mark. One day in 1964, Arch West., marketing vice president for Frito-Lay, toured some retail outlets in Southern California. At one store, he noticed a number of greasy kraft paper bags on a Frito-Lay rack. Inside the bags he found little pieces of toasted tortillas. His first reaction was that if people were buying those, maybe Frito-Lay should be making it. West decided to go to Alex Moralis of Alex Foods, a tortilla maker whose company made tortillas for Frito-Lay’s Disneyland restaurant. West wanted to determine whether tortilla chips could be produced on automatic equipment. Moralis said yes, and several months later Frito-Lay gave birth to the Doritos brand of tortilla chips in the west and southwest, to tremendous response. Doritos were rolled out nationally in 1966, and virtually every snack manufacturer jumped on the bandwagon. Very quickly, tortilla chips became America’s second favorite snack. A year earlier, PepsiCo International merged with the growing Frito-Lay Co. to create a beverage-snack giant, and the snack industry was blooming all over Europe and many other countries. Harvey Noss visited European snack companies frequently, the SFA reports, looking for new members to the association. Orville Redenbacher, who began growing popping corn at 12 years old, saved enough money to go to college with his first popcorn business. By the 1940s, he was raising popcorn for the supermarket trade, and in 1965, he and business partner Charles Bowman, perfected a hybrid popcorn that was light and fluffy, had minimal hulls and left few unpopped kernels. The tasty product also achieved a 44:1 volume ratio of popped to unpopped kernels. Four years later, Redenbacher launched his first popcorn brand, Red Bow, and was on his way to popcorn fame. He put the “lighter” and “fluffier” challenge to the test in TV commercials in 1976 and the product and Redenbacher became a sales success. His famous slogan, “You’ll like it better or my name isn’t Orville Redenbacher,” was a winner, and the product quickly made him a popcorn king and legend. ConAgra Foods bought the Orville Redenbacher brand in 1983 and later launched various line extensions, such as SmartPop 94% fat-free, Cheddar Cheese and Spicy Nacho, which popped up hot and fresh in the microwave. Redenbacher passed away in 1995, but his innovative popcorn legacy lives on. By the 1970s, America faced a serious oil shortage. Gasoline prices soared and packaging of potato chips was evolving from glassine and paper bags to foil bags. Paperboard boxes and canisters were becoming increasingly expensive. Foil prevented light penetration and did a better job of keeping chips fresh over a longer period. But the switch was rather difficult and expensive for some companies, and the additional cost for foil was significant. Companies like Herr’s were convinced that consumers would prefer a product that stayed fresher longer. In addition, Jack and Rosemary Shearers bought a snack food distributorship in 1974. A fourth generation of Shearers, sons Bob and Tom joined the family food business and expanded their route sales fleet. By 1979, the Shearers wanted to offer customers a more complete line of snacks. Unable to find products that met their high standards, the family began its own snack food manufacturing operation, and made their first “hand-cooked” kettle potato chips in a small rented facility on Harrisburg Avenue in Canton, Ohio. The Shearers hand-cooked the chips, packaged them in 1-lb. plastic bags and sold them under the Kettle-Cook’d label. Customers were excited by the new product and quickly added it to their shelves. In fact, kettle chips have became so popular that new product introductions occur to this day. Yet early in the 1970s, the SFA says that the snack food industry faced two threats—the first real challenges it experienced since World War II. Potato chips, now a billion-dollar category, were being characterized by the nutrition community as “junk food.” PCII mounted a spirited campaign, hiring nutritional consultants to fight back. One key phrase in the campaign pointed out that “there were no junk foods, only junk diets.” Potato chips and other salted snacks had a place in a responsible diet. But the decade was a time when “health food” became a trend, and “growing or baking your own” was catching on. By the end of the decade, with the association’s influence, a large percentage of snack food products contained a nutritional profile on packages. With mounting government legislation and regulation affecting the food industry, the SFA says that it moved its headquarters from the Cleveland area in the late 1970s and set up shop in suburban Washington D.C. to be closer to the action. The second threat was also due to the industry’s growth. As the snack industry ballooned, so did retail food marketing. Traditional small food markets were morphing into larger and larger supermarkets that eventually grew to be 60,000 sq. ft. and more. Snack food sections of stores became cavernous, often stretching the width or length of a store. Convenience stores were beginning to scatter across cities and nearly every neighborhood. Then there was the advent of mass market retailers like Walmart and Kmart (and later, Target), which began to cannibalize business from many of the established product categories, such as toys, small appliances, clothing and others, including snack foods. Many chip makers apparently feared that the uniform new chips would carve into the regular chip market. In a lawsuit filed on behalf of the industry, a federal court ruled that the new products could be called potato chips as long as a disclaimer was prominently displayed on the package that they were made from dehydrated potato flakes. Proctor and Gamble eventually built Pringles into a major brand and became an important member of the association. The bar code was adopted for packaging in supermarkets and drugstore chains, giving retailers and snack food manufacturers instant information on product movement. More computerized management systems were being developed to help the industry handle more and more information and facilitate their operations. The SFA says it helped to spread the word on how these new developments could help make operations more efficient and profitable. Waste disposal and inflation were creating mounting problems in the early 1980s, and states were enforcing environmental laws and stricter waste disposal legislation. Recycling was a term heard more in the later part of the decade. Interest rates were at 13- and 15% and oil prices were escalating. Yet the SFA celebrated its 50th anniversary in 1987, and both the multi-billion-dollar industry and the association were strong. Manufacturers, packagers and consumers were still hopeful for the future. But in the course of a decade, the world would be rocked by revolutionary developments that changed the landscape of snack food marketing and the retail food business. The snack food industry also consisted of one national full-line company, Frito-Lay, and many strong regional companies across the country early in the decade. The SFA says that two of them decided to challenge Frito-Lay as the dominant national snack food company. One was Borden’s, a multi-faceted food and dairy company, which purchased Wise Foods in 1964 from the Earl Wise family. The other was Anheuser-Busch of St. Louis, the “King of Beers.” Borden bought numerous regional snack food companies in the 1980s, boosting its snack food volume to more than $1.5 billion. Anheuser-Busch, on the other hand, with its beer distribution business as its flagship, began building a snack business, literally from the ground up, and eventually reached national status with its Eagle Brand Snacks. The SFA says that the three-way battle between Anheuser-Busch, Borden and Frito-Lay and regional chippers in the middle played right into the hands of retailers, many of which benefitted by selling snack food aisle shelf space by the facing to the highest bidder. But the war didn’t last. By 1993, Borden couldn’t find a buyer for a national “super” brand it was trying to create, and it began disassembling its national network. Thus, most of the companies it acquired earlier eventually disappeared from the landscape. Anheuser-Busch left the snack whirlwind in 1996, after spending millions overall, and ended up selling its four plants to Frito-Lay. In the meantime, the Food and Drug Administration issued a requirement for nutritional labeling to be applied to most foods regulated by the agency, including snacks. The SFA reports that it helped educate its members about the ins and outs of the new regulations and that’s why snack companies had few troubles meeting the May, 1993 deadline. The act also set a January 1, 2006, deadline for trans fatty acid labeling. Walmart was beginning to emerge from Bentonville, Ark., as Sam Walton continued to nurture his stores until there were nearly 1,200 of them by its 25th anniversary in 1987, with sales of $15.9 billion. By the early 1990’s, Walmart was ready to move across the country as America’s largest food retailer, and later focused on the world. By 1994, the industry was undergoing tremendous changes. The three Rs—reduce, reuse, recycle—were created for packaging. More new flexible snack food packaging structures were developed. The industry was going more global, as evidenced by the tremendous increase in Latin American exhibitors at the SNAXPO show that year. It was also becoming less family-oriented and more corporately controlled. This is according to SF&WB editor at the time, Wendy Kimbrell. With the influx of Hispanics coming to the United States, it wasn’t surprising that Frito-Lay came up with a baked, low-fat version of Tostitos tortilla chips in 1994. Original Tostitos were introduced in 1979 and were distributed nationally starting in 1981. Made from all-white corn, Tostitos were meant for dipping in salsa and other dips. Sales grew quickly, and in 1985, the brand was Frito-Lay’s fifth-largest, according to Wikipedia, generating annual sales of $200 million at that time. Tostitos became a long-term success and is even more popular today. Proctor & Gamble created a fat-free substitute called Olestra,which was approved as a food additive by the FDA. In 1998, Frito-Lay introduced no-fat WOWchips. In 2004, the New York Yankees baseball team replaced Cracker Jack with the milder, sweet butter toffee flavored Crunch ‘n Munch at home games. After a public outcry, the club immediately switched back to Cracker Jack, according to Wikipedia. Walmart’s impact on the country and on retailers was relentless. It used to be that the marketing people worked with consumers to find out what they wanted, designed products, advertised them and people bought them. Walmart changed all that. Walmart also changed who made the decisions in the supply chain to American consumers. Later, in 2009, Frito-Lay’s development of SunChips brand multigrain snacks coincided with Walmart’s sustainability mandates. The product was rolled out in compostable packaging bit by bit between 2009 an 2010, with a fully compostable bag out on Earth Day, 2010. Frito-Lay dropped the biodegradable bag within 18 months after it was the target of viral social network attention because of how noisy it was. But with all of the trials and tribulations in the business, it’s very safe to say that snacks are not going away any time soon. In fact, it’s quite the opposite. Today, sales of iconic brands such as Procter & Gamble’s Pringles chips, to Kellogg Co., are more and more common. The Pringles business was sold for a whopping $2.695 billion. Kellogg established a strong U.S.-based snacks business when it purchased the Keebler line more than a decade ago. Pringles will fit in well with its core strengths in brand building and innovation. Kellogg also now owns high-quality snacks such as Cheez-It crackers. What’s more, snacking a few times a day or more is a growing phenomenon. Restaurants and others are capitalizing on expanding snacking occasions by offering quick, portable, smaller-portioned, low-priced food in a myriad of ways to keep gaining market share of snack purchases. Restaurants now claim 22% of consumers’ snacking occasions, up from 17% in 2010, according to food industry consultant, Technomic, Chicago. “Recent consumer research indicates that snacking is becoming a larger part of consumers’ daily lives,” says Technomic executive vice president Darren Tristano. Technomic’s recently released “Snacking Occasion Consumer Trend” report finds that more than a third (37%) of consumers have broadened their definition of snacks to include more types of foods, beverages and restaurant fare. Impulse purchases of snacks are up from two years ago. The study also reports that 62% of purchasers said most of the snacks they bought for away-from-home consumption were impulse purchases. More than 33% of consumers expect to eat more healthful snacks in the coming year, indicating greater importance for operators to offer and promote better-for-you snacks. In March, PepsiCo said that its potato chips have gone global. The company’s Banner Sunpotato chip brands generated more than a whopping $10 billion in annual global retail sales anchored by Lay’s, the world’s largest food brand (Banner Sunalso includes brands such as Walkers, Smith’sand Sabritas). The Banner Sunlogo, which appears on its packaging, has grown into a symbol for quality potato chips around the world, the Purchase, N.Y. company says. Lay’sand Walkersare among PepsiCo’s portfolio of $22-billion food and beverage brands, a number that has doubled since 2000, further illustrating the strength of the company’s worldwide food and beverage business, and proof positive that snacks are a powerful market segment now and for many, many years to come. Despite the ongoing economic difficulties the country has faced since 2008, new product activity in the global snack food industry appear to surge on, unabated. Figures reported by Innova Market Insights in March showed a strong double-digit increase in 2011. Savory and salt snacks accounted for just below two-thirds of the total, with snack nuts and seeds taking up the remainder. The amount of snack manufacturers in the national footprint of producers is shrinking, but the volume of snacks produced and consumed continues to set records. Snyder’s of Hanover has quickly climbed the ranks to be the nation’s top pretzel producer. Wise eventually wound up in the hands of Palladium Capital Partners of New York in 2000. The SFA says that a lot of credit for the tremendous growth and success of the industry is due to the entrepreneurial spirit of the snack manufacturers. But a great deal of credit must also be given to vendors in the industry, who have worked hard and diligently to bring technological breakthroughs to the table that have helped improve the quality, productivity, accuracy and shelf life of many snack foods. We hope they all celebrate our 100 years with us. This entry was posted on Monday, June 25th, 2012 at 9:00 am and is filed under Anniversary, Flavor, Menu Trends, Snacking. You can follow any responses to this entry through the RSS 2.0 feed. You can leave a response, or trackback from your own site.